A tooth luxation is a dislodgment of the tooth from its normal position in the alveolus. Lateral luxation is defined as displacement of the tooth other than axially. Displacement is accompanied by contusion, comminution or fracture of the alveolar bone. Horizontal forces displace the crown palatally or labially and the root apex labially or palatally. Damage may include rupture of the periodontal ligament (PDL) and the neurovascular supply of the pulp, compression of the PDL, and severance of the neurovascular pulp supply. Maxillary lateral luxation is more common than mandibular. Most injuries result from falls, traffic accidents, sports and violence. The tooth is displaced vestibular or lingual/palatal and may be locked into that position. The cervical zone is aligned with the adjacent teeth. On percussion, it may give a high metallic (ankylotic) sound. The tooth is usually not mobile or tender to touch, due to its locked position in the alveolus. In most cases, the tooth will give a negative response to vitality/sensibility testing (electric pulp test, ethyl chloride test, Laser Doppler Flowmetry). The crowns of laterally luxated teeth are in most cases displaced lingually and are usually associated with fractures of the buccal part of the alveolar bone. The tooth is usually not tender to touch, but mild pain may be evoked during clinical examination. Refer to a hospital in case of history of central nervous system symptoms. A complete interrogation of the nature of the injury must be established, including how, when and where the injury occurred; force of impact; characteristics of the impacting object; and direction of the impact force. Perform a full head and facial examination to rule out other injuries, including an intraoral examination of hard and soft tissues. Evaluate whether treatment is suitable in primary care or should be referred to a hospital. Tooth evaluation should include mobility testing, percussion and pulp testing. Radiographs (periapical, occlusal, lateral) may show widened PDL space and displacement of the apex. Fracture of the alveolar bone may also be present. Diagnosis is made after an extensive dental history, clinical examination and radiographic findings. In an acute lateral luxation, there is lack of pulpal response, with no response to sensibility tests. Management of soft tissue injuries requires cleansing (i.e., with saline or sterile water), debridement, hemostasis and closure. Chlorhexidine 0.1% mouthwash is used twice a day for one week to reduce bacterial population. The clinician may treat a soft tissue injury with tissue adhesives or resorbable natural sutures. 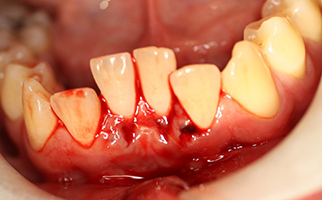 Deep intra-oral wounds may require referral to an oral and maxillofacial surgeon. Nonsteroidal anti-inflammatory drugs and systemic antibiotic treatment (e.g., penicillin) should be used at the discretion of the clinician. Tetanus prophylaxis should be considered in case of contaminated injuries (verify the tetanus immunization status of the patient). Local (buccal and palatal) anesthesia could be given, but an intraoral infraorbital regional block is another reasonable option. Reposition the tooth with forceps or with digital pressure, minimizing trauma to the patient as much as possible. Stabilize the tooth with a flexible splint for 4 weeks. Soft diet for a week and meticulous oral hygiene (chlorhexidine 0.1% mouthwash) is indicated. Ensure a dry field on the teeth to be splinted. Etch the surface of the teeth to be splinted with 37% phosphoric acid for 20 seconds. Rinse thoroughly and dry with compressed air. Apply adhesive to the teeth to be splinted. For resin splints: composite material is placed to rigidly connect approximal surfaces of adjacent teeth to each other. For wire or fibreglass ribbon composite splints: measure, cut and adapt the wire or fibreglass ribbon to the contour of the teeth to be splinted. Place a small amount of composite on the teeth, place the splint over the composite and cure the composite material. Apply more composite material and cure again if needed. Monitor pulpal condition (with vitality testing) in subsequent appointments since tooth response may vary immediately after acute dental trauma. 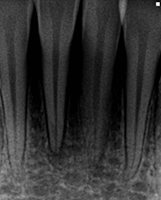 In case of pulpal necrosis, a root canal treatment is indicated to prevent root resorption. In case of pulp necrosis in teeth with incomplete root development, the revascularization is an alternative to the traditional apexification. Splint removal after four weeks. Follow-up appointments for clinical and radiographic assessment of pulpal vitality is recommended. The electrical vitality test is the best choice for monitoring pulpal health during long-term follow up, since conventional pulp sensibility tests are not as accurate. Presence of pulp necrosis, pulp canal obliteration, root resorption, and marginal bone loss are common healing complications. Predictors of an unfavourable outcome include signs and symptoms of apical periodontitis, negative response to pulp sensibility testing, external root resorption, need of endodontic therapy, tooth locked in place, and radiographic signs of apical periodontitis. Advise use of helmets, seatbelts and mouthguards to prevent orofacial injuries. Figure 1: Frontal view of 17-year-old male who was hit in the face with a hockey stick. Teeth 31 and 41 are displaced lingually by approximately 6 mm. Figure 2: Periapical radiograph taken day of the trauma. 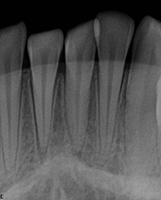 Obvious displacement of teeth 31 and 41 with increase in PDL space. 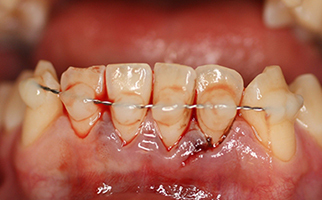 Figure 3: Frontal view of flexible splint using twisted orthodontic ligature and composite. Figure 4: Radiograph at follow-up for splint removal one month after the accident. Tooth 31 was negative for cold and electrical pulp testing. Patient was scheduled to start root canal treatment with calcium hydroxide on teeth 31 and 41. Dr. CDM Afrashtehfar is a Canadian physician with a private practice in Cuernavaca, Mexico. He is also a dental undergraduate student. Dr. Marleau is the chief of the division of dentistry, department of pediatric surgery, Montreal Children's Hospital, McGill University Health Centre. She is also an assistant professor with the faculty of dentistry, McGill University, Montreal, Canada. Acknowledgments: Dr. Stéphane Schwartz, former director of the division of dentistry at the Montreal Children's Hospital, McGill University Health Centre (MUHC), for providing all images for the Figures. Diangelis AJ, Andreasen JO, Ebeleseder KA, Kenny DJ, Trope M, Sigurdsson A, et al. International Association of Dental Traumatology guidelines for the management of traumatic dental injuries: 1. Fractures and luxations of permanent teeth. Dent Traumatol. 2012;28:2-12. American Academy of Pediatric Dentistry Council on Clinical Affairs. Guideline on Management of Acute Dental Trauma. Pediatr Dent. 2012-2013;31(6 Suppl):230-8. Nikoui M, Kenny DJ, Barret EJ. Clinical outcomes for permanent incisor luxations in a pediatric population. III. Lateral luxations. Dent Traumatol. 2003;19(5):280-5. Dabbagh B, Alvaro E, Vu DD, Rizkallah J, Schwartz S. Clinical complications in the revascularization of immature necrotic permanent teeth. Pediatr Dent. 2012;34(5):414-7. Evaluation of care of dentoalveolar trauma. J Appl Oral Sci. 2010;18,(4):343-5. Bastos JV, Goulart EM, de Souza Côrtes MI. Pulpal response to sensibility tests after traumatic dental injuries in permanent teeth. Dent Traumatol. 2014;30(3):188-92. Andreasen FM, Kahler B. Diagnosis of acute dental trauma: the importance of standardized documentation: a review. Dent Traumatol. 2015 Oct;31(5):340-9. Srivastava A, Gupta N, Marleau A, Afrashtehfar KI. How do I manage a patient with intrusion of a permanent incisor? J Can Dent Assoc. 2014;80:e50.